The surprising, never-before-told tale of the indispensable yet unsung casting director Marion Dougherty, an iconoclast whose keen eye, exquisite taste and gut instincts redefined Hollywood. Marion Dougherty helped usher in the New Hollywood through her casting of films like "Midnight Cowboy," "Butch Cassidy and the Sundance Kid" and "Bonnie and Clyde." Lynn Stalmaster did the same with movies like "The Graduate" and "Deliverance". They brought new kinds of leading men and women to the screen, such as Dustin Hoffman, Bette Midler, Robert Duvall and Gene Hackman. Marion Dougherty plucked several now-iconic actors out of obscurity, among them James Dean, Warren Beatty, Robert Redford, Christopher Walken and Glenn Close, giving them their first break in front of the camera. With strong, original opinions about authenticity and a knack for discovering unique talent, she turned the old Hollywood system on its head by using actors with a nuanced sense of character and individuality, rather than depending on typecasting, and broke racial barriers by pairing Mel Gibson and Danny Glover in the "Lethal Weapon" series. 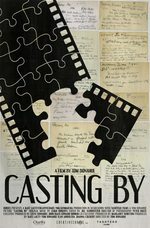 CASTING BY was presented at the 2012 Toronto International Film Festival, the 2012 New York Film Festival and the 2013 Los Angeles Film Festival, and won the Audience Award at the 2013 Sebastapol Film Festival. I watched this a few months ago. I was really struck by the parallels casting has to other woman-dominated niches I've come across before (for example, rights management in book publishing). The common denominator in these niches is that they barely existed as a profession, or were regarded as pointless or unnecessary by the men who ran the industry, until some enterprising woman (or women) realized how vitally important and game changing the work could be. So many clips of baby actors, Hollywood history goldmine.